The complete Raisonance hardware / software solutions for the industry-leading, standard ARM 32-bit embedded processor cores, facilitate mastery of these advanced cores and provide everything users need to write, compile and debug their applications. Software tools include the free GNU C compiler for ARM and the Raisonance integrated development environment (Ride7), which provides start-to-finish control of application development including code editing, compilation, optimization and debugging. 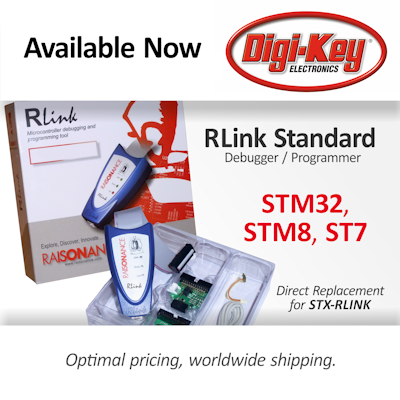 Hardware tools include the RLink in-circuit debugger/programmer (USB/JTAG), Open4 (EvoPrimer) application development platform as well as Primer promotional tools and REva starter kits designed to help users explore and master new devices so that they can concentrate on creating applications, not on learning new tools.